Www.timeline-wp.com is a service created by the SIMILE labs. It is a widget for visualizing temporal data. 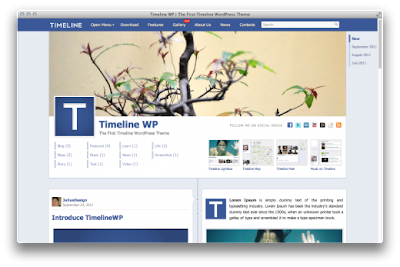 Now you can also have the timeline theme for your word press. It was developed in just ten hours but will work wonders for you bloggers. Displays the individual categories on the time line, it creates a life stream timeline along with RSS feed from your word press link archive, customizes colors for the timeline band, by using the template tag it supports multiple instances on different pages, displays individual images and icons along with the custom fields, displays images attached with the posts, available in English, German, Italian and Spanish languages. The plug-in is smart yet simple to use. If you just know how to cut, copy, past then you can easily work with this one and create a beautiful timeline which would cost you lot of money if created elsewhere. The header and the footer, the tabbed contend and navigation is all under you control. You also have the license so that you can install multiple numbers of word press websites. It allows bloggers replicate the timeline that facebook has updated this days. And this all can be done very effortlessly by a blogger. You can navigate the months with the scrubber, fixed style, your categories can be highlighted, and photos can be visualized with the help of light boxes. You can also add 4 items that you want to place on the upper right header which is always present on every page. It will definitely look like the timeline theme on the facebook and this all is available absolutely free. To get this you just require a word press and can view the demo on www.timeline-wp.com and a GPL license.